Beyond the double entry door lies a backyard paradise with panoramic water views that at sunset will take your breath away. This 3BR/2.5BA pool home allows room for everyone to have their own private space. Features include separate formal living room, formal dining room & family room with wood burning fireplace. Kitchen is spacious and overlooks the lanai with water views. Master suite has dual sinks and large shower and features his/hers closets. Oversized secondary bedroom with ½ bath could be used as a second master suite, has a walk-in closet and its own access to the lanai. Large outdoor lanai is accessible from 4 sliding doors, features a summer kitchen and large pool with rock waterfall. 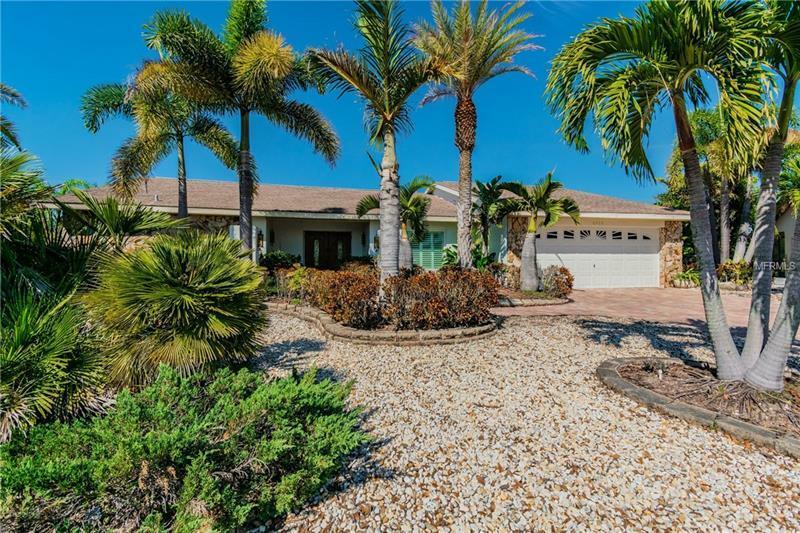 Situated on a large 1/3 acre cul-de-sac lot this home features brick paver driveway, xeriscape back yard for easy maintenance, dock with Trex decking and the lawn is adorned with loads of palm trees and fruit trees all on a pie shape lot offering 176 feet of new seawall! Bring your boat, water toys, etc. ~ NO HOA or CDD. A/C units 2016.